Download trial version of multifilesplitter NOW! 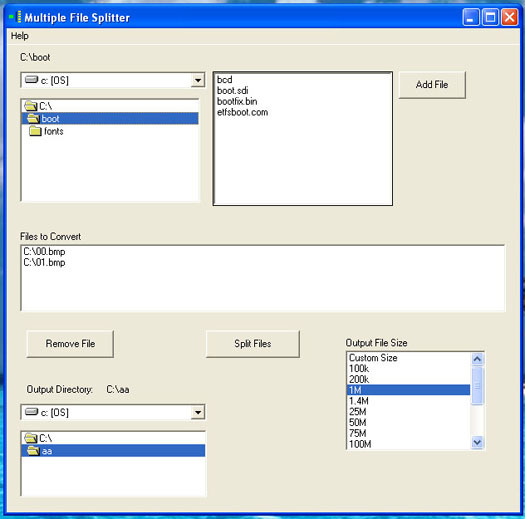 Multifilesplitter is designed so you can select multiple files to be split into smaller files. Multifilesplitter allows you to select the output directory for where the multifilesplitter will output the files. Multifilesplitter allows you to select the number of bytes for each file from a list of standard file sizes, or you can do a custom split output file size. Multifilesplitter creates a .bat file so no additional program is needed to restore the original file.